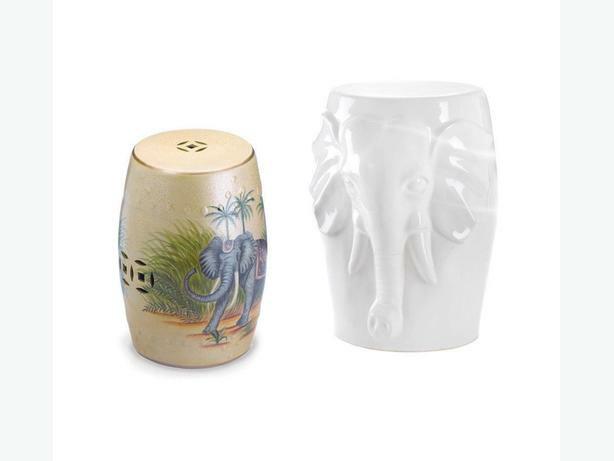 Elephants are often used as symbols of wisdom, strength & good luck - you get that, plus great style, with these gorgeous artistic accents. The possibilities are endless...a chic seating option, a clever side table, a plant stand, a foot rest, a standalone accent, a display for a collection of candles or ornaments, a figurine or vase, anything that will fit - their versatility ends with your imagination whether it be indoors or protected areas outside! You get 1 of each...they vary just slightly in size but both are hollow inside with a bottom opening measuring approximately 6" diameter and have a maximum weight limit of 200 lbs. exotic motif has a crackled finish overlaid with a breathtaking Far East scene featuring a noble elephant in regal dress...12" x 12" x 18" high & weighs 15.2 lbs. gleaming white elephant is 13.4" x 13.4" x 18.1" high & weighs 14 lbs.